(This story appeared in the Lansford Evening Record sometime in 1965. Thanks to Frank Kassak, CHS "61, for sharing this with us). "No wonder Tom Raymer is ranked among the all-time top schoolboy football coaches in Pennsylvaniahis record is something to behold. When the 1964-65 school term came to a close, the long illustrious career of the former Coaldale High School coach ended along with it. Suddenly, area athletics won't be the same now that the "Casey Stengel" of area football has retired. "Actually, Raymer's final game in his grid coaching career was the immortal Coaldale-Lansford Turkey Day battle staged in 1963. The game signaled the end of an era and the beginning of the Panther Valley Jointure. Raymer devoted 39 years to the fortunes of Coaldale High School football and reaped the glory that only a few men ever attain in a lifetimean all-time winning record. "Raymer's lifetime record in 24 years as a head mentor at Coaldale was a sensational 162-60-17 from 1924 until 1948. From the 1949 campaign until the historic 1963 finale, Raymer served as an assistant grid coach. He served as an aide to Andy Kalen (1949-55), Bob Wear (1956), Tom Leonard (1957), Bill Roller (1958), George Greiner (1959) and Geno Poli (1960-63). Against arch-rival Lansford in the traditional Turkey Day series between the two neighboring schools, Raymer's Coaldale Tigers held a 13-8-3 edge. The Coaldale-Lansford rivalry was a tribute to Raymer's expert coaching and to Coal Region football. The stadium was jammed at each battle, including the grand finale, which was won by Lansford. However, this came at the close of a fantastic gridiron era of the Orange and Black as dwindling enrollments were taking the toll on the gridiron scene in the small mining community located in Schuylkill County. Coaldale, which played some of the best in schoolboy football, posted an unbeaten 10-game mark in 1930, representing Raymer's top season at the helm. In 1934, the Tigers again streaked to a perfect mark in nine games. In 1928, they compiled a 7-0-1 record. There were three seasons when the highly-feared Orange and Black dropped just one game. A tribute to Raymer's fine coaching is the fact that his teams suffered just three losing campaigns, which occurred in 1937, 1943 and 1944. The Tigers captured three wins in both the 1937 and 1943 seasons and won five games in 1944, despite being on the wrong side of the ledger. "Raymer came to Coaldale after graduating from Susquehanna University via Chicago, where he coached schoolboy football for two years. The "Old Fox" was an outstanding gridder himself and performed with the famed Coaldale Big Green when he replaced Irvin Murphy as head coach at Coaldale High School. Murphy served as Coaldale's first gridiron mentor. Raymer's famed short-punt formation baffled the opposition time after time. His hard-hitting teams were well known throughout the state and many other parts of the nation. The Tigers often played out-of-state teams. Raymer's desire to win them all certainly rubbed off on his young players and many of them went on to college via football scholarships. When the Panther Valley Jointure came into reality, Raymer took on the difficult task of compiling the school's first athletic schedules, serving as faculty manager. He also accepted the head track coaching positionand following in typical Raymer traditionthe Panther Valley cinder team dropped just one dual meet in five outings. "It just won't seem the samewith Tom Raymer missing on the sidelinesbut it will undoubtedly be very tough for him to be away. He'll be on the scenebut for the first time in almost half a centuryhe'll be watching as a spectator." is a victim of old Father Time. He taught them a bagful of tricks. A man who will never say "quit." He never knows when he should sit. When he scampers and fumes on the line. When his team is behind. 'Tis then when you should see our Tom. And look where he'll get a few beers. For the dinner you'll praise when you're through. And how can the lady be calm. We'll visit him often at Bangor! The last stanza hints that Coach Raymer was going off to "Bangor" when this ode was written on January 24, 1949. I've never heard that Coach Raymer ever left, or even ever thought about leaving, Coaldale to coach at Bangor, and we can't find anyone else who remembers why The last stanza hints that Coach Raymer was going off to "Bangor" when this ode was written on January 24, 1949. I've never heard that Coach Raymer ever left, or even ever thought about leaving, Coaldale to coach at Bangor, and we can't find anyone else who remembers why this ode says that. Does anyone know about the why this ode was writen with Bangor being mentioned?" "ANDY TAKES OVER TOM'S COACH JOB AT COALDALE HIGH. On Monday, May 16, 1949, Andy Kalen was named the new football and basketball coach at Coaldale High School as Tom Raymer steps down after 25 years of service. 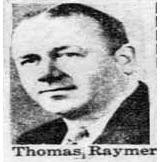 Raymer was busy as the new owner and guiding light of the Bangor Slaters, a professional baseball team in the North Atlantic League, a Class D organized baseball loop."